A NEW EXHIBITION of photographs, portraits and propaganda of the Republican leader and suffragette Countess Markievicz has gone on display. This year is the 100th anniversary since Markievicz became the first woman elected to the House of Commons (but didn’t take her seat due to the Sinn Féin policy of abstentionism). Markievicz also played a prominent role in the 1916 Rising, was the second woman in the world to hold a Cabinet position, and was an active member of the suffragette movement. This latest collection is made up from items from the National Gallery of Ireland, the National Museum of Ireland, National Library of Ireland and Dublin City Gallery The Hugh Lane. The pieces are juxtaposed to demonstrate “the breadth of Markievicz’s representation over time”, and their different media, the Gallery said. 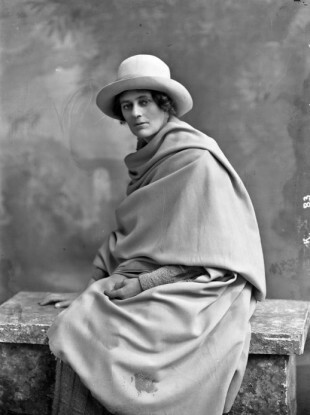 The exhibition includes an early portrait of Markievicz – a double portrait of her and her sister, Eva Gore-Booth, at their family home in Lissadell, Co Sligo, by Sarah Purser – as well as a painting of Markievicz on her deathbed by her husband, Casimir Dunin Markievicz. Other pieces include a photo of Markievicz dressed as Joan of Arc, taken from a series of tableaus of powerful women from history, and one in which she appears in Celtic Revivalist costume. Exhibition curator Donal Maguire said that for many “Constance Markievicz is at once a familiar and mysterious figure”. “She is of undeniable and widely recognised cultural and political significance, given her role in the history of modern Ireland but retains an air of intrigue to this day. In curating this exhibition, my objective was to expand people’s understanding of Markievicz by showing the diversity of her image over time, an image that she endeavoured to manage. ‘Markievicz: Portraits & Propaganda’ opens at the National Gallery of Ireland on Saturday 27 October 2018 and runs until Sunday 10 February 2019. Admission is free. Email “New exhibition aims to deshroud mystery around Countess Markievicz”. Feedback on “New exhibition aims to deshroud mystery around Countess Markievicz”.